Good morning Chicago Blackhawks fans! The Chicago Blackhawks picked up a win and a much needed 2 points in Arizona last night, but it sure wasn’t as easy as it should have been. The Chicago Blackhawks were in full cruise control last night when they stormed out to a 3-0 and 4-1 leads last night in Arizona. It looked like a game that the doctor had ordered. The Hawks were scoring early and often with some classic Marian Hossa breakaway goals and one-time from Artemi Panarin that is almost as good as and as the NBCSN announcers say looks very similar to a Brett Hull one-timer. 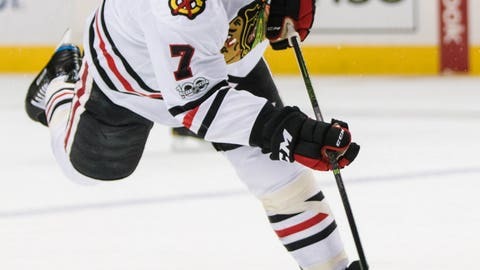 Then of course the wheels came off for a while, and the walk in the park game for the Hawks in front of a very pro-Blackhawks crowd in the desert became a nail biter after a couple of deflected goals got past Corey Crawford. Of, course in the end the Chicago Blackhawks and Joel Quenneville got a much needed win and 2 points, but it sure was a lot more difficult than it should have been. Seeing Panarin and Patrick Kane score again after a bit of a drought is a good thing, and one thing I keep waiting for is Kane to really break out and take over the stat sheet and games for a week or two which he really hasn’t done this season. The Hawks still have a 9 point cushion over the St. Louis Blues, but it would be nice to string together some wins now that we got this game behind us. 2/2 – Chicago Blackhawks Morning Links: Happy Groundhog Day! Here are some Chicago Blackhawks morning links to kick off your Friday!